To walk into Compact Gallery is, quite often, to momentarily leave San Luis Obispo behind, as it’s one of a precious few local spaces where “installation” means far more than hanging paintings on walls. Consider the current exhibit of “Ice Gallery North,” a joint effort by four artists, longtime friends, and owners of San Diego’s Ice Gallery. Lee Lavy, Thomas DeMello, Michael James Armstrong, and Joseph Huppert have conspired to create a show that’s wonderfully fine-tuned to Compact’s many uniquenesses, like its off-center skylight, unnecessary second door, or the position of the sun in regard to the windows. And while this site-specific show could only exist at Compact, it’s also totally alien to the cute, complacent little city in which the gallery sits. 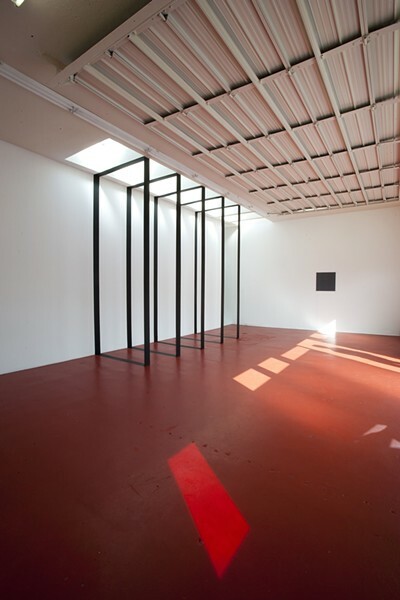 LIGHT AND SPACE : Michael James Armstrong’s piece 5 Black Rectangles was built specifically for Compact Gallery’s unusually situated skylight. Armstrong was one of four artists from San Diego’s Ice Gallery who created the site-specific exhibition “Ice Gallery North” at Compact. The first thing you may notice, crossing the empty lot en route to the gallery, is that its inexplicable auxiliary door has been replaced with something far more intriguing. DeMello’s contribution, titled Compact Door, is elegant and unobtrusive: a white door with a strange red window, comprised of several layers of Plexiglas and red theatrical gels. It casts a red square of light that slowly migrates across the gallery floor, becoming, by early afternoon, a mere sliver, before disappearing altogether. Armstrong’s 5 Black Rectangles is the first piece to catch visitors’ eyes once inside. Built around the building’s skylight, it appears at first to consist of, well, five black rectangles standing floor-to-ceiling, as if pretending to hold the roof on their angular shoulders. But upon closer inspection, you’ll see that three of their sides are merely painted onto the ceiling, floor, and wall. The fourth side, consisting of a strip of aluminum, is the only three-dimensional aspect to the piece. It’s a simple work, yet visually arresting; viewers at the show’s mid-afternoon reception could be seen walking the length of it and back, watching the clean black angles align. Huppert was unable to attend the installation of “Ice Gallery North,” sending two gorgeous graphite-on-vellum abstract drawings in his stead. The untitled works are the only part of the show not built to directly interact with the space, but they do so anyway, their silvery hues reflecting the gallery’s red floor. A white wall has been erected to separate the front of the place from the back, and walking past it, viewers are confronted with an entirely new environment created by Lavy’s piece 1 2 3 4 5. Lavy, whose art the other three described as “very messy,” created the work by throwing water balloons filled with India ink at the white ceiling and floor, controlling the splatter formations by cutting slits into plastic sheets before placing them in the line of fire. The results are abstract, chaotic black-and-white images, some delicate, some heavy and globular. The work, and maybe the show as a whole, feels unavoidably Rorschachian: What you see depends on who you are. But you can’t talk about “Ice Gallery North” without referencing Ice Gallery, the low-cost experimental studio and exhibition space where these four artist/owner/curators have been holding exhibitions for nearly six years, regularly challenging the artistic sensibilities of their North Park neighborhood. Originally the site of a dry ice manufacturer, the place was for many years a shared studio/gallery location for several local artists. When its four current owners moved in, they preserved the gallery’s name, in keeping with the spirit of the artists that had gone before them. However, Ice isn’t a traditional gallery with, say, hours of operation or objects for sale. Receptions are noticeably lacking in wine and cheese. Its four owners are the only artists who show work there, and their exhibitions are funded out of pocket. Though the gallery has housed only solo shows since its current residents moved in, the other three artists regularly work to help the fourth achieve his creative vision. COMPACT ON ICE: See “Ice Gallery North,” a group show by the four owners of San Diego’s Ice Gallery, at Compact Gallery at 1166 Higuera St. in San Luis Obispo. Hours are Wednesday through Saturday, noon to 5 p.m. Reach Compact at 235-3256 or visit compactgallery.net. For more on Ice Gallery, visit icegallerysd.com. But Ice Gallery’s whole operation wouldn’t be possible without the artists’ collective work experience in San Diego museums and galleries. All four have at one point worked as preparators at the San Diego Museum of Contemporary Art (though only Huppert and Lavy currently work there) and credit this background with giving them a technical education in the construction, installation, and lighting involved in the preparation of museum-quality shows. Huppert now works as an assistant to San Diego artist Robert Irwin, known for his site-specific light and space artworks. It was during the installation of Irwin’s retrospective at the Museum of Contemporary Art, in late 2007, that the four made the acquaintance of Compact owner Jamieson, who was also involved in assisting Irwin. That connection later led to an invitation to visit Jamieson’s San Luis Obispo gallery and, if so inspired, to create an exhibit tailored to the space. Regularly working with other artists—often removing personal opinions from the equation—has also contributed to the group-effort ethos of Ice Gallery. At Ice, each artist has curatorial control and freedom to make what he likes, but knows he can rely upon the others for both aesthetic advice and the manpower to realize complicated installations. However, “Ice Gallery North” presented a new challenge to the four artists’ working dynamic. “Since we’ve had this place, we’ve never had a group show, because we kind of get in each other’s way really quickly,” Huppert continued. Suddenly, Ice Gallery, known for its temporal exhibits, is feeling rather temporal itself. The Compact show might be Ice Gallery’s last—for a while, anyway. Catch it while you can. Arts Editor Anna Weltner says brrrrrrrrr. Contact her at aweltner@newtimesslo.com.